Some NHL players never receive enough credit for the on-ice production they offer to their respective teams. Every season, there are players who fly under the radar and manage to have a great season and help their team every game without making the headlines a la Sidney Crosby or Jonathan Quick. These unheralded and underrated players often play in the shadow of another star player and never get enough credit for the little things they do on the ice on a nightly basis. Nearly two-thirds into the 48-game season that was shortened by the lockout, I gathered a panel of 12 writers here at The Hockey Writers to determine who are the top 10 most underrated players in the NHL nowadays. Only the 10 players with the most votes made it to this undervalued list. The heart and soul of the Canadiens, Prust is working and battling hard every shift despite his lack of flashy offensive skills. At 6’0”, 195-lbs, Prust isn’t the biggest man out there, but he’s certainly one of the toughest as he is not afraid to fight anyone. Before going down with a shoulder injury, Prust was having a great season with the Habs, scoring 4 goals and 5 assists for 9 points in 25 games with a team-leading +13 differential, as well as 81 penalty minutes. Prust is more than a tough guy as he can also take a regular shift, kill penalties and take face-offs. Bergeron does everything well on the ice: he wins faceoffs efficiently (61.8%), he kills penalties and he can play at the point on the power play. The 27 year-old pivot is a combined +77 in the past three campaigns and he has already won a Stanley Cup, an Olympic Gold Medal and World Championships. Arguably the best two-way forward in the NHL nowadays, Bergeron is a lock to make Team Canada for the 2014 Winter Olympics in Sochi. A dark horse for the Norris Trophy this season, Beauchemin has never been known for his offensive prowesses, but rather for his steady defensive play. A Stanley Cup winner with the Ducks in 2006-07, Beauchemin is playing against the opposition’s best players game in and game out, playing an average of 24 minutes per game, while killing penalties and playing on the second power play unit for the surprising Ducks. A great shot blocker, Beauch is adept at blocking the passing lanes and a poke-checking his opponents. He does all the little things that often go unnoticed on the ice. 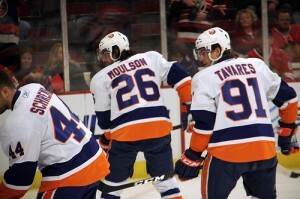 A late bloomer, Moulson has been playing in the shadow of John Tavares’ spotlight in Long Island for four years now. Again this season, the 29 year-old sniper is producing at a hectic pace with Tavares and Brad Boyes, with 11 goals and 22 assists for 33 points in 32 games and a -11 rating. A power play specialist, Moulson is among the league leaders in power play points with 14 (7 g and 7 a) and has a knack for finding the back of the net: he scores on 14% of his shots. Moulson had scored 30 goals or more for three consecutive seasons prior to the NHL lockout. Mikko, the younger of the Koivu brothers, is finally having the chance to play with a very talented winger in Zach Parise this season. In 30 games, he has recorded 7 goals and 19 assists for 26 points and a +3 differential for the surging Wild. The captain of the Wild is good at both ends of the ice and is a very undervalued play-maker who finally has the chance to play for a contender. His leadership qualities and hard work will finally be recognized should the Wild go deep in the playoffs. Playing almost 25 minutes a game for the Rangers, Girardi is one of the best shot blockers in the league with 80 blocked shots this season. 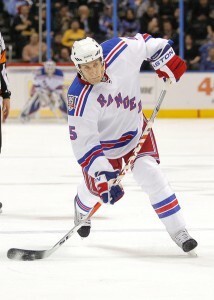 The undrafted defenseman has recorded 1 goal and 9 assists for 10 points for the struggling Blue Shirts. He keeps his game so simple that all the good things he does on the same almost completely go unnoticed: killing penalties, making good outlet passes, clearing the front of his net, etc. Don’t forget Girardi when it comes to Team Canada’s roster for Sochi, as the undervalued blue liner is as steady as they come on the blue line. A late bloomer, Parenteau needed almost ten years to finally make it to the NHL after being drafted in 2001 by the Anaheim Ducks. PAP blossomed in Long Island after a short stay with the Rangers, posting two 50-point seasons alongside Matt Moulson and John Tavares before signing as an unrestricted free agent with the Avalanche this summer. In 31 contests this season, the playmaker has recorded 14 goals and 17 assists for 31 points for the last-place Avalanche. Despite going on three consecutive seasons with solid performances, Parenteau remains an underrated top-six forward around the NHL. Voted the most underrated play by his peers, Eriksson is a very good two-way forward who keeps flying under the radar and putting good offensive numbers year after year. After a slow start this season (before Jamie Been was re-signed), Eriksson has recorded 9 goals and 12 assists for 21 points in 31 games for the disappointing Stars. Eriksson is big and strong, and is almost impossible to knock off the puck. He has a deadly wrist shot and he sees the ice like a playmaker. 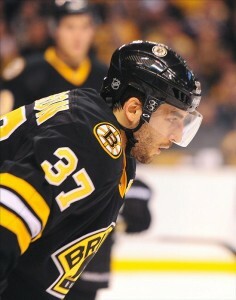 He is also capable of shadowing the best forwards in the game, and he can anchor a forward group defensively. A two-time Stanley Cup champion, the ageless Elias is currently riding a 14-season streak with at least 15 goals. The 36 year-old veteran is having another strong season with the Devils, having notched 10 goals and 19 assists for 29 points in 32 games with a +8 rating. With 923 points in 1,074 games, Elias is slowing nearing the prized 1,000 point mark as an NHL player. He is one of the best Czech players to ever play in the league. A very underrated defensive player, Elias holds the franchise records in goals, assists and points. One of the most underrated captains in the league, Ladd is almost single-handedly carrying the Jets on his back and willing them towards the playoffs. With 14 goals and 18 assists for 32 points in 33 games with a +9 rating, Ladd brings a physical and spirited dimension to the game similar to Ryan Callahan of the Rangers. He has almost no notoriety around the league and although he would be a perfect fit, gets no mention when it comes to players who could be on Team Canada in Sochi in 2014. After winning a Cup with both the Hurricanes and the Blackhawks, Ladd knows what it takes to lead a team to the Stanley Cup. This wraps up THW’s panel on the top 10 most underrated NHL players this season. Do you agree with the list above or do you think we missed someone? Follow me on Twitter if you want to talk puck!